Although Branham Tabernacle is not hosting this Jubilee Message today, they encourage you to hear it. « 1 † ` Thank you. It's good to be here, tonight, again. I didn't know how they ever found out I was going to pray for the sick. Everybody come in to be prayed for. You know, I believe if you follow the leading of the Spirit, it's all right. That's the best, that's a Message that never fails. 2 Now, I was setting in the room today, after... a certain minister that's just so dear to my heart (three of them), three of my real good friends, they told me they was coming to go to lunch with me. And I thought, "Well, that was just fine," you know. « 3 † So I--I just eat a little bit of breakfast 'cause I was sure they was going to pay for it, you see, and I... have a good full dinner. So 12:00 come, and 1:00 come, and 2:00 come, nobody there yet. So there was... the police was chasing a criminal, down there in the yard, and so I went down to see that episode. I couldn't find Brother Jack at all. So, I come to find out, the hotel man had give him the wrong number; and he was ringing the wrong door, all the time, where I--I wasn't at. I'll let him pay for me, one again, though, sometime. Him and Brother Tracy, I was sure glad to see them and Brother Brown tonight. That just seems like we ought to go back in Arizona again. « 4 † I can remember coming across the desert the other day. I told my wife, back there, I said, "Here's where Brother Jack set in the back of this little Chevrolet." Brother Brown and him argued all about the--the original creation, whether it was done in six days or whether it was done in six million years. That was a good one. 5 They get so arguing, they get out and get a handful of rocks, and one get behind one pole, and one another, and throw rocks at one another just as hard as they could. They couldn't settle it that way, say, "I can outrun you." Down the road they'd go; Brother Jack, a little short fellow, just as hard as he could twist; and Brother Young with them long legs, you know. I never laughed so much in my life! 6 Then, Brother Jack got back in the car and pulled off his shoes. Brother Sharrit had give us a big sack of oranges, and he half cleaned them up before we got to Shreveport. « 7 † You know, them's golden days, though. Yes, sir, they're golden days. I know it sounds joking, funny, but it's the truth. But we... there's something about that, as you get older and begins to linger on your mind. You think of those days that you wished you could live again, that's right, our younger days. And as we get old, they all become pictures. I'm so glad it was pure and holy, and brotherly fellowship, in love. Knowing that we're going to a land where we'll never get old, where... that great Land, yonder, where we'll never, never grow old or never die. « 8 † One of our precious brothers, so dear to us all, he just crossed over in that Land. And everytime I come to this platform, I--I guess I'll think of Brother Lyle. I looked over last night and seen little Judy setting over there, and my heart was just pounding, I was thinking of how she felt. And I know when dad died how... But we only have to go through those schools of sufferings to know how the other fellow feels. « 9 † I believe I'm looking at an old minister friend setting here. I just can't call him. Is that right? You used to pray for the sick here, all the time, years ago? Gerholtzer, that--that German name, I--I never could get it fixed up just right. Brother Tracy had met him out there. And I knowed him about ten years, and I said, "You haven't aged six months in that ten years." We are living in a world that must cease someday. « 10 † Now, tonight, I was... Had you real late last night, I'm going to try to not do that tonight. Finish my story; I was thinking about, tonight, preaching on a--a subject of the Rapture, to the church. How the conditions, as I see it in the Scripture, what conditions the Church will have to be in for the Rapture, and what will take place just before the Rapture takes place, and how it will take place. And we all believe in the Rapture, don't we? We believe in It. And then, all at once, Something just said, "Pray for the sick, tonight." And I had just eaten dinner with a little Mexican brother there, I went down and picked him up on the street. I guess he's here tonight, he and his wife. « 12 † Brother Young Brown used to give out the prayer cards for me. And I found him real honest and never catch him selling a card or doing anything wrong, he's real straight. And we have caught them trying to do that, you know. So--so we... Brother Young, he was right on the job all the time, and faithful. And I remember, he used to stand and take up the cards, and bring them through the line. I'd pray for them and we'd go along, just that unadulterated faith those people had, if they could just get near you they'd get healed. And I think there was twenty healings to the one, to what we have now. « 13 † Then, this story come in this afternoon about a man, he's probably here now. That he was in the prayer line, a year ago, somewhere, and--and he had... said, in the discernment was told that he had had the mumps. And the doctors told him, after the mumps fell, that he could never have a girl baby, and he always wanted one. I think he had boys. But in the vision from the Lord, it told him, "But you're going to have that girl baby." « 14 † And he said he's got the little girl here tonight. I don't know the man, might... would--would he be in the audience, or the--the person that I'm speaking of? Somewhere? I don't know, somebody just told me about it, outside. Oh, here's the baby hanging right back in here, setting right... That's fine. That's very fine. What a sweet little fellow. It wasn't so far to walk over everybody to... real cute, little baby, I'd have her come out here and give the testimony. Maybe she will by tomorrow, or sometime when we're having our services. 15 Now, tomorrow morning is the Business Man's Breakfast. Have you announced it? I guess, it's all... That's fine. « 16 † And now let's have a little--a little lesson on Divine healing. How many believes in it? Oh, my, going to be a great night, when you have faith like that. People who believe it, that's what it takes. It's for the believers. 17 Now, then, I got me a pencil and begin to write down some text and so forth, and the... and then Billy knocked on the door and said, "Daddy?" 18 I said, "Wait just a little while, I haven't got it finished yet." 19 He said, "But, Brother Jack's waiting on you." So, I--I had to come on. I stuck, didn't have no paper clip, I got one of Meda's "johnny pins" or some kind of a pin here that they called a "bobby pin." That's what it was, "bobby pin," just some kind of a pin. And--and I don't know much about them things, you know, and I just seen it laying there. So, now to make a paper clip here, to separate what I was... had some notes for in the morning; separate them, one from the other. « 20 † And as you get older... it used to be I could just remember them Scriptures and things just so easy. But, you know, kind of hard to do. Do you find that trouble, Brother Jack, yet? That's right, yeah. I told Brother Jack, here not long ago, I said, "You know, Brother Jack," I said, "I'm getting so I can't remember." I said, "I start to say something, and I have to wait." 21 He said, "No." Said, "I ring up somebody on the phone and say 'What'd you want?'" I thought you was kidding me then, Brother Jack, I found out that's pretty true. 22 Yes, sir. My, how you forget. But let us have all of our deeds done right, because they're in a book, a record that is to be played at the day of the judgment. « 23 † Now, we're like one big family. And I don't suppose we're hooked up tonight, across the country, as I was preaching my message last night. I think it's just maybe the local assembly here. So, last night, I sure appreciate your courtesy of standing... I don't try... I didn't try to take advantage of Brother Jack. But he's always told me, "Say what you want to." And so I just come here... the platform and preached a little doctrine. But... so just a... I believe it's just... some of my denominational brethren. « 24 † I had a dream, the other morning. I don't dream very often, I'm not a dreamer. But I--I dreamed that I seen a man, a young fellow in shackles, and he was trying to get out, and--and I said... Somebody told me, said, "Those are horrible people, don't have nothing to do with them." 25 And I seen this young fellow getting out of his shackle so I just let him alone. I thought, "I'll just see what he does." So when he got out, he was a nice fellow. And I seen others trying to get out. « 26 † Now, this is only a dream. And I walked over this a-way and I seen a--a brother, Roy Borders, a very good friend of mine, lives in California. Looked like there's something wrong, his eyes was half closed, and great big... maybe cancer or something over his eyes. And I... someone was trying to pull me away from him. I screamed, "Brother Borders! In the Name of the Lord Jesus, snap out of that!" 27 And he just barely could speak, saying, "Brother Branham, it'll have to take something more than this. I just can't grasp it, Brother Branham. I just can't grasp it." 28 I said, "O Brother Borders." I love him. « 29 † And someone pulled me away, and I looked, and it was a lady standing over here that I, when I was a little boy, I--I used to haul groceries from the grocery store to the peoples. And her name was Mrs. Fenton, she lives in Jeffersonville yet, a personal friend to the wife and I. « 31 † I looked around, and I said, "I wished I could." And go on, looking around; and I... my little, bitty body and--and them great, big iron bars; and those poor people in there. And you couldn't get to them, them iron bars was setting close together. And I looked, and they were beating their head like they were out of their mind. 32 And I seen some lights flickering around in there. And I looked up, and there stood the Lord Jesus with a--a--a lights of rainbow around Him. He was looking right straight to me, said, "Deliver those people." And He went away. 33 And I thought, "Well, how could I deliver them? I--I haven't got strength enough in my arms to break those bars." 34 So I said, "House of hell, give away to the Name of Jesus Christ." 35 And all the creaking and popping, and--and the rocks a-rolling, and--and bars a-falling; and people running, screaming, "Delivered!" and screaming at the top of their voice, and was all delivered. « 36 † And I was screaming then, "Brother Roy Borders, where are you? Where are you? God is delivering His people! Where are you, Brother Borders?" I've wondered about that. 37 You know, Brother Borders is very scared. You know the prophecy, all... many of you do, you take the tapes and so forth, about the West Coast. « 38 † There's a man setting right here, tonight, that was there when that happened (when we were standing there, on a hunting trip), a minister who was listening in last night. With a blinded eye, he just come up there and he said... introduced himself. He had on colored glasses, up in the mountain. He said, "Brother Branham," said, "I'm Brother McHughes." He said, "I--I helped sponsor one of your meetings once, in California." 39 I said, "I'm glad to know you, Brother McHughes." « 40 † So there was about twenty man standing there. We was out javelina hog hunting. And I said, the day before going up the mountain, I said to Brother Banks Wood... All of you know him, a personal friend. I said, "Brother Wood,..." Picked up a rock and threw it up in the air, and it came down. And I said, "THUS SAITH THE LORD, 'Something's fixing to happen.'" 41 So, he said, "What is it, Brother Branham?" 42 I said, "I don't know, but within twenty-four hours you'll see. Something's fixing to happen. That's a great sign." « 43 † And the next day... that was one late afternoon. The next day, about ten o'clock, we were fixing to pull out. Everybody had their javelina hogs, and we were standing there. And Brother McAnally, you know, and all of them, they were dressing them out, and--and Brother Borders and I; and Brother Roy Roberson, a crippled veteran, a very dear, precious friend of mine, and he was standing there. And I looked up, and Brother McHughes said, "Brother Branham, does the Angel of the Lord ever appear to you when you're on these hunting trips?" 44 I said, "Brother McHughes, yes. That's right. But, I come out here to kind of rest." 45 He said, "All right, Brother Branham," said, "I didn't mean to disturb you." 46 I said, "You didn't disturb me." « 47 † And I just looked around, and I seen a doctor looking at his eye. Now, I didn't know him, he had on dark glasses, which is awful bright and sunny in Arizona. And I looked at it, and I seen a doctor tell him, say, "Sir, I been doctoring that eye for years, two years, something like that." Said, "The allergy that you have in your eye, you're going to lose your eye. It's eating back into the sight, and there's no way I can stop it." 48 And I said, "What you asked me that for, is because of your eye. Them sunglasses is just because you got a bad eye." 49 He said, "That's right." 50 I said, "Your doctor," (described him) "he told you, a few days ago, that 'You're going to lose that eye because the--the allergy is eating into the sight of the eye.' And he's been doctoring it for a couple years, and he can't stop it." 51 He said, "Brother Branham, that's the truth." « 52 † And I started to turn around and look, and I seen a--a woman much older than he, kind of a dark complected. They're originally from somewhere up here in Arkansas. And so she raised up her--her--her skirt and showed her limb to her son, and she said, "Son, if you see Brother Branham, tell him to pray for my feet." And had long tumors hanging between her toes and things. 53 I said, "Your mother's a gray-headed woman, and she raised up her skirt, pulled back her--her stocking and showed you her feet, and said if you saw me to tell you to pray for her." 54 And he said, "Oh, mercy." 55 I looked back and I seen him standing there with no glasses on, vision, I said, "THUS SAITH THE LORD, God healed your eye, and heals your mother, too." « 56 † About that time, I turned around... Now, there's man setting here, was standing there. I said to Brother Roy Borders... or Brother Roy Roberson, put my hand on his shoulder, for he's a veteran, I said, "Brother Roy, get under something, right quick, something's fixing to happen." 57 He said, "What do you mean, Brother Branham?" 58 I said, "Don't talk! Get under something, quick!" And I turned and picked up a shovel, there by the side of the place, and walked off from them 'cause I knew it would come where I was at. « 59 † Right beside a great canyon, eight or ten times higher than this building, it's a "box" canyon; like a fire come down from the Heavens, like a whirlwind, just a few feet above where I was standing. And ripped the rocks right out of the mountain, went out through and cut the tops of the mesquite trees off, for a hundred yards out. Everybody running, and trying to get under trucks and everything else. It went back up again and clapped like a great thunder. Went back up in the skies again, and come down again. And done that three times. And when it was all over, they come over and asked, "What did it mean?" 60 I said, "I don't want to tell you, it was a judgment sign. In a few days, a great earthquake's going to strike on the West. And it won't stop. California, Los Angeles will sink. It's going down. She'll slide right into the ocean." And two days after that, the Alaskan earthquake shook Alaska. « 61 † And then, the last meeting I had in California, while speaking, and didn't know nothing happened till I got on the street, It told California, said--said, "Capernaum, Capernaum, the city that's called by the name of the angels," (that's Los Angeles) "you've exalted yourself into heaven, but you'll be brought down into hell. For if the mighty works had been done in Sodom that's been done in you, it would have been standing till this day." « 62 † Now, the last few days, the great roaring and popping. Then, here come out a paper of science, said, "It's all honeycombed, it's got to go under." They just know it. 63 And you watch, the water will come plumb back into the Salton Sea. Los Angeles is doomed for judgment. I tell you before it happens, that you might know when it does happen. I never spoke that by myself. And I've never had Him to tell me one thing but what happened. And you can bear record of that. That's right. When? I don't know. « 64 † I went out, and they told me what I said. And I listened, went back and searched the Scripture. You know, Jesus said, almost in them same words, about Capernaum; and Sodom and Gomorrah was--was in the bottom of the Dead Sea, I suppose was then. And later, about a hundred years later, Capernaum slid into the sea, and it's in the sea. The same God that put Sodom in the sea for its sins, the same God that put Capernaum in the sea for its sins, the same God will put Los Angeles in the sea for its sin, that city of--of corruption. 65 Brother Roy Borders is scared to death. I don't know whether to... what that meant that, or what. I don't know. « 66 † Lord, it's so good to testify to real listeners. We believe, Lord, help our unbelief. And we realize that we're going right down the road now to the end of the world. Just what time, we don't know. But that secret catching away of the Bride; one of these days, Lord, we'll be--we'll be raptured, caught up with Him. And we're waiting for that day. Prepare our hearts, Lord. 67 There's many, we look, laying here on these cots and stretchers, man and women who are bound by the enemy. There's people setting out there, perhaps, if You don't touch them, they'll die with heart attacks. Maybe some of them is eaten with cancer. 68 And Father, Thou knows the heart of every man. You know whether it's true or not true. And we say these things because that we know what You have done, Your great power has delivered so many. We're witnesses of it, though they try to tell us that "those things doesn't happen." But it does Lord. We are witnesses. « 69 † I pray tonight, Lord, that somehow You'll build faith in these peoples' hearts, that every one of them will be delivered, all these sick and afflicted people. May it be so simple, Lord, just let us, as we try to teach the Word. Let the Holy Spirit take my mistakes, Lord, and correct them in the hearts of the people. And make it a real, real night that the... that He can bed Himself into the heart of each believer here. We set this night for that purpose, Lord. May those who are not saved, above all things, be ready; get ready now, while the doors of mercy still open. We ask this in Jesus' Name. Amen. 71 Someone laid a--a note here on the desk, and said they "took up an offering" for me tonight. That wasn't necessary, don't do that. I can't take it back. I remember one time, in Calgary, Canada, they took up an... this offering was taken up. Brother Jack was trying to tell me... My wife setting back there; she, the children had an old two rooms we were living in, she had to put a blanket in the door to keep the--the door shut so the children wouldn't get pneumonia. And she said... He said to me, said, "Brother Branham, that's not fair to treat her that way." So, you remember the case. They took up, I forget how many thousand dollars. 72 And I said, "Oh, take it back, Brother Jack." 73 He said, "Now, how we going to do it?" So, I bought the place and it's there. So, to the glory and honor of God. We kept it for a couple years, the wife and I, as a gift from the church, the people. 74 And then I thought, "That doesn't sound right. I brought nothing into this world, it's certain I'll take nothing out." So I turned around and lotted it, and deeded it back over to the tabernacle. That when I'm finished, well, some other servant of God, if there is a tomorrow, will use it then. See? So, thank you very kindly, friends. God bless you, for it. « 75 † Now, in James, the Book of James, the 2nd chapter. We want to read, beginning at the 21st verse. 76 And now, I just about... A little while to teaching, and then we'll start praying for the sick just as quick as we can, and get just as many people through this prayer line as we possibly can. And let's, too, remember also... I don't want to forget Sister Anna Jeanne and Brother Don, and them, I think they're over in Thailand somewhere. Aren't they? To where? Bangkok, and--and the mission fields. There's so many things you think about in the daytime, you want to mention before the people. Then when you come here, you--you can't think of it, you're ream right down on that lesson. « 77 † And now, in James here, the 2nd chapter. And we're going to begin with the 21st verse of the 2nd chapter of Saint James, and read a--a portion of It. The 21st verse of the 2nd chapter. « 78 † Now, my subject tonight... And hold your Bibles now, 'cause I got several Scriptures written down here. If we don't get too long, I'll refer to many of them. My subject is: Works Is Faith Expressed. Now, remember: Works Is Faith Expressed. Works show that faith has already took a-hold, see. See? Now, we choose this because we... I believe that it might help us to understand. Now listen real close, and we'll go into it like a Sunday School lesson. 79 Here James is expressing in his teaching, from Genesis 22:1-9, what man seen in Abraham. « 80 † Let's just go back, I've got the Scriptures kind of marked out here. In Genesis, the 22nd chapter, and the 1st to the 9th verse. And it came to pass after these things, that God did tempt Abraham, and said unto him, Abram... Abraham: and he said, Behold, here I am. And he said, Take now thy son, thine only son Isaac, whom thou lovest, and get thee into the land of Moriah; and offer him... for a burnt-offering upon one of the mountains which I will tell thee of. See, He didn't even tell him which one it was. You just go ahead when God speaks, you go on moving. See? « 81 † Now, he had in his mind now, he's going up to kill his son, 'cause God told him to. But look at the Scripture here. 82 Now, we find here that James is justifying Abraham by his works. « 83 † But now, in Paul, in Romans, the Book of Romans, the 8th... the 4th chapter, 4:1 to 8. I won't read it all, but just read part of it. 84 Now--now what Paul is referring to here, is what God seen in Abraham. « 85 † Now let's... if you... if we was not turning too much, we'd go back again to Genesis, the 15th chapter, and the 6th verse; 15:6, I believe is right. We'll begin at the 5th. « 86 † Now the two men that were talking on faith: Paul justified Abraham by what God saw in Abraham; but James justified Abraham by what man saw in--in Abraham. 87 See, now, James said, "He's justified by his works." 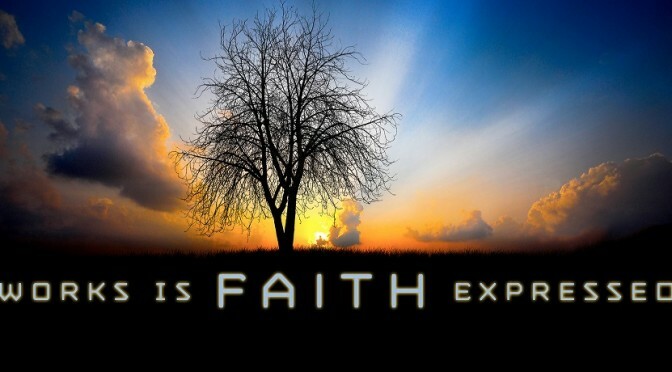 88 Paul said, "He's justified by faith." 89 But see, Abraham believed God, that's what God saw in him; he believed It. But then when he went to acting as though it was already done, that's what man saw in him. 90 And that's the same as it is to us, because our works express what faith we have. But if we're afraid to act on what we believe, then we do not believe It. See, you've got to believe It. « 91 † Abraham's works was expressing his faith he had in God's promise. Now, Abraham, remember, he was ninety years old, or a hundred years old, and Sarah was ninety years old. And now they were well stricken in age, past child bearing, had been for many, many years. And they had lived together as husband and wife since they were young, and no children. But yet, God told him when he was seventy-five years old, and Sarah sixty-five, "You're going to have a baby." And he believed God's promise. He believed It. Now, see, he made ready everything for this baby. See, that's what God saw, when he believed God; and man saw what he did to express what he believed. (And that's the same thing that works tonight, the same way it is with us.) It has been revealed to him. See, it had been revealed to him, so he believed it so, and was acting as though it had already took place. 92 Now, let's just stop there, just a minute. Sometimes we misunderstand this. People gets emotion, and they try to work on emotion. That won't work. « 94 † I remember one night, I never will forget it, up in San Jose or somewhere. He come to wake me up, I hadn't slept for several days and I didn't know I was talking to the man, but said that I told him. Started crying, said, "I'm going home." See? 95 "Why," he said, "you can't go home. There's a meeting going on down there." 96 I said, "Well, I'll be ready in a few minutes to go home." See, just beyond, beside myself, almost. See, I was a boy then. « 97 † Like you're learning to swim, you know, you splash the water and go across the pool, and "huhhh, huhhh, huhhh, I made her!" Now, after you learn to swim, more graceful is the stroke, and it don't "wear you out" so much. See, that's it, you learn how to do it; and cut every corner and make it better, and that's more of a ease. See? 98 A little boy that never walked, would try to walk down this aisle here, he would fall down a dozen times and be "wore out" before he got there. But anyone who knows how to walk, an athlete, would walk right down that aisle and never even notice doing it. Well, he had that to start with, that's what he is now. « 99 † Well, that's the same way with preaching Divine healing or anything else. As you go along, you begin to learn. If you don't learn, there's something wrong. See, you've got to learn, and you've got to learn how to accept God and what it really means. 100 We allow it, sometimes say, "Well, this guy didn't have enough faith, this guy didn't do this and this." There's a reason there for that, there's a reason. Sometime it's unconfessed sin. You could pour a gallon of oil on a person, and scream till you got hoarse, it'll never move that devil. No, sir! You've got to confess that. That's what discernment does, say, "Go make that right, bring that out." 101 But it's so slow doing that, you see. And then--then the rest of them get impatient, and they say, "Ah, I never got prayed for." But we want to find a way now, that... what takes place, the real basic of Divine healing. « 102 † Now, a gift, just like I said last night, "A gift is wonderful, but you can't base your Eternal destination on gifts." You cannot major on a minor, and a--a gift is a minor. And Satan can impersonate any gift God's got, he can make something just exactly like it, see, exactly. Therefore, we got to watch that. 103 Like sometimes I express about shouting; I've seen demons shout, see. Speak in tongues, I've seen demons speak in tongues. Sure, he impersonates It. It isn't a genuine, but it impersonates It, you see, makes it look like it's real. And people sometime, who don't know the difference, declare this to be "real" when it isn't real. « 105 † Now, faith is "a revelation from God." Now, faith is a revelation. There's where I want to stay, there, just a moment. It's a revelation. He has revealed it to you by His grace. It's nothing you did. You didn't work yourself up into faith. You ever have faith, it's give to you by the grace of God. And God reveals it to you, therefore faith is a revelation. And the whole Church of God is built upon the revelation. « 106 † A Baptist minister told me, not long ago, he said, "I just can't accept revelation." 107 I said, "Then you cannot accept the Bible. You cannot accept Christ, because He is the Revelation of God. He's God revealed in flesh." Therefore, the whole Church is built upon Divine revelation. 108 Jesus said to (I believe it was Peter)... said, He said, "Who does men say I the Son of man am?" 109 He was talking to His disciples. "And some said You're 'Elias,' and 'Moses,' or 'One of the prophets,' and 'Jeremiah.'" 110 He said, "But who do you say?" 111 He said, "Thou art the Christ, the Son of the living God." « 112 † Now, the Roman Catholic church says, "He was speaking to Peter, 'Upon this rock I'll build my Church.'" 113 The Protestants said, "He was building It upon Himself." 114 Now, they could be right. But, to me, both of them's wrong. It was upon the spiritual revelation of Who He was. "Flesh and blood has not revealed this to you, Peter. But My Father, which is in Heaven, has revealed this to you. And upon this rock," the revelation of Who He is; upon the revelation: He is the Word, and the whole... "Upon this rock I'll build My Church, and the gates of hell cannot prevail against It." It showed the gates of hell would be against It. « 115 † Abel, by faith, revelation, (no Bible written in those days)... by Abel, by faith, offered unto God a more excellent sacrifice than that which Cain. Which God testified, "He was righteous." How? By faith. How? By revelation! By revelation, Abel offered unto God a more excellent sacrifice, because it was revealed to him that it wasn't fruits of the field, it was the blood. 116 That's why some people can believe It, and some can't believe It, some try to make-believe It. « 117 † In a audience of people, where a prayer line comes through, you'll find some... and they were all good people, we'll say. There's some that's trying hard to believe It, trying to work themselves into It. Some just can't do it at all. And others, it's just by grace, it's just given to them. Now, there is the difference. See? That does it. That's the real revelation, because faith is a revelation from God. It must be revealed first. « 118 † Jesus clearly expressed this when He said, "No man can come to Me except My Father draws him first, or reveals Me to him first." You ought to read that. It's Saint James... or Saint John 6:44 and to 46. They didn't know Who He was. They thought He was just an ordinary man. They thought Him just to be, as people does today, some prophet. He was the Prophet, He was an ordinary Man, but there was more than that. « 119 † Just like last night, speaking... When you get the book, you're going to see maybe a little confusion there of what I said, "The two books of Life." It's the same Book, but one of them is your natural birth, the other one is your spiritual birth. One leads out to the other one, just like a stalk of wheat. Whenever you talk to me, you talk to me as a living person. But there's a part of me here, is that person, that must perish. That's the Book that the name comes off of. But the Eternal one, the Predestinated one, the Elected one, the name never can come from there because it was always on It. It can never be taken off. You'll notice it in the book, so to save your confusion. You'll find it that way. Because, I think, Brother Vayle, who put the right grammar to it, reminded me of it today. I said, "That's right." « 120 † The Baptists believe there's two separate books. And in one way it is two separate books, and another way it isn't two separate books. I'm two separate people... I'm body and soul and spirit, three separate people, but I'm... only one makes me as a being. 121 There's only real one Book of Life. Like there was one germ of--of the wheat that come up through the stalk, and went through the tassel, and out through the husk, and into the wheat; all the way along there, you say, "Now, that's a wheat laying there." It isn't the wheat, it's the stalk, but together it's the wheat. See, it's the wheat because it's all one stalk, but the wheat is what you're talking about, the grain at the end of it. The others was a carrier, it must perish. And that's the one--one place sounds like you can have your name taken off the Lamb's Book of Life, and the other place you can't do it. So, that's where it is. It's all in that great revelation there, which was made known during the time of the Seven Seals. Why is it, how some people can't believe It? « 122 † Jesus said that "No man can come to Me except My Father draws him first. And all that the Father has given Me, will come to Me." No man can understand Who He is, or how It is, except it be revealed to you by the revelation of God. And then faith in that, you act accordingly. See? Here we see plainly that God is revealed in Jesus, and only those who were foreordained to see it, will see it. Be sure to read this Scripture, I omitted it then, that Saint John 6:44 to 46. I omitted it because I thought maybe we'd have... maybe not enough time to go through, because that clock up there just keeps moving. 123 And so we... You notice, "No man, no man can come except My Father draws him first. And all the Father has given Me, they will come." They'll recognize It. No other man can do it, no other person, no matter how good, who you are, It's got to be revealed to you. Then you see Who Jesus Christ is. « 124 † Now, here, predestinated plan is in plain view. Just as other seed, the Word of God is a Seed and must have the ground prepared beforehand. If you sowed seed, just throwed it out there on the ground, it would do no good, the birds would pick it up. You throw it among thistles and thorns, it'll choke it out pretty soon. Jesus' parable said so. So the ground has to be made ready first. So, God, in sovereign grace, prepares the heart first. He prepared you before the foundation of the world, to receive Him in this age. He foreknew you by His foreknowledge, and ordained you to Eternal Life. He knew you, therefore He prepared you. « 125 † That's the reason you staggered out of these things, and staggered into what you have now. It was God leading you to the place where He had ordained for you to be. It... or if--if--if this ground isn't prepared beforehand, it can't grow. That's the reason the seed of faith, when you're preaching faith, see the discernments of the Lord, and see what takes place, and all the gifts of the Bible working; people working themselves up, "Oh, hallelujah, I believe It." And come up, and find themselves disappointed. See, the ground has to be foreordained. And you know when It strikes it. « 126 † Like my little eagle, last night. He knew when he heard that scream of that mother eagle, "there's a lot difference between that and the cluck of the hen." See, because he was an eagle from the egg. Not... he wasn't made an eagle right then, he always was an eagle. And a Christian always was! That's the reason the divorce, when you're divorced, because you were trapped into it, see, by your first parent, Adam and Eve. You become a sinner by nature. You didn't want to be, but now you heard the Gospel, and "faith cometh by hearing," revelation comes by hearing. There is a little something inside of you. 127 Another man setting right by you, say, "Ah, I don't believe that stuff. Nonsense! I don't believe that. Nothing to that!" « 128 † Like they did on the Day of Pentecost, they laughed and said, "These men are full of new wine." They know it was... It was a great thing to those it was happening to. Why? It was God revealing Himself to the individuals. While others laughed, these were rejoicing. It was an individual revelation, which is faith; faith that's revealed. If it wasn't faith, then it wouldn't even be there. It was faith. « 129 † Just seeds has to have the ground prepared first. "Therefore, all He foreknew, He called. All He called... All He foreknew, He predestinated." If you want to read that, Romans 8:28-34, and also Ephesians 1:1-5. See, all He foreknew, He did call. All He called, He justified. And all He justified, He has already glorified. There's nothing out of order. We think there is, but look in the Scriptures. It's just hitting exactly the way God's Word said it would. We see the Message is rejected, today. Isn't that just what the Scripture said they would do? Sure, all these things are ordained of God. « 130 † Oh, It should make you walk happy. That's the trouble with we today, so much difference than the Christians of old. When the real, true revelation of Jesus Christ being Emmanuel dwelled in the hearts of those men, they were rugged people. But today we're patted by denominations, with, "Oh, I tell you, they ain't got the Revelation. You come over here." You're depending on their revelation. If their revelation isn't according to the Word of God, then it's wrong; mine or anybody else's, that's where the showdown comes. The Word of God tells which is right and wrong! « 131 † Any seed has to have its ground, of course. "Therefore, all He foreknew..." See, He already knew what was going to happen. Notice, Jesus said again, about the Seed, "Some fell on rock, others in mixed ground." See, over where there's thorns, thistles, and everything else, It couldn't grow. And others on good ground, good ground, good soil, which had been prepared, already prepared. « 132 † All the man out here, he's like as a chicken, he's looking along, trying to find. He hits into this, and he hits into that, but after a while there comes a sudden Scream from Heaven. He recognizes It right quick, "That's the Word of God!" See, he knows It because there's something in his heart that's been told to him, revealed to him about It. « 133 † Notice, the prophet Isaiah said, "A virgin shall conceive." What a strange saying. How a--a man in his right mind could say that? There had never been a virgin conceive. "A virgin shall conceive!" Now, he didn't worry about saying It, he just said It. How's she going to do it? And that's not his business! He is just to say what God said He was going to do. God revealed it to him, showed him the vision; revealed it, and it was right. « 134 † Just the same God that told me that little baby would be borned by that man who couldn't have the child... have a girl. Like others and things, how it sounds strange when the doctor says, "It can't happen!" 135 But when God says, "It's going to happen," it depends on what kind of a word that falls in. Remember, the prophet stood up there and His Word went forth. « 136 † Like God, in Genesis 1, He said, "Let there be light. Let there be this. Let there be that." Created man in His Own image, image of God created He them, male and female, and there was nothing on the earth yet. Then, we find out in Genesis 2, here, He made man in His Own image. There was no man to till the soil, after the rest the creation. What was it? It's His Words, He was speaking It. And when He spoke, He said, "Let there be light." There might of not been light for eight hundred years afterward, might not have been no light, but He said It! And as long as He said It, "Let there be a palm tree. Let there be an oak tree. Let there be this," them seeds was forming down beneath that water. That's right. And in the season, in the time, in its own season, it brought forth! It can't fail; it's God's Word. It just can't fail. It's been expressed. « 137 † Now, one day, God talked to man, face to face. But in time of Moses, when the fire was falling, they said, "Let God... Let Moses speak; not God, we might perish." 138 Therefore, He said, "I'll not speak to them like that no more. I'll raise them up a prophet." That's the way God's system always was. 139 Now, here's a prophet standing; now, he's under inspiration; he isn't thinking about his intellectual, "Now, wait a minute. If I'd say that, well, you know, the people would think I'm insane." See, that's his intellectual; there he's listening to Satan, just like Eve did. « 140 † And as long as the doctor says that "You can't live. You can't get well. You can't do this or that." As long as you listen to that, that Seed will never fall in that kind of ground and do any good. It can't. But when something tears all of that away, and It falls in that bedded ground, there's nothing can tear It out. 141 Now, no matter how long it takes, It's going to happen. Now, He said, "A virgin shall conceive." Did you know it was eight hundred years before that happened? God foreknew the woman, who she'd be, what her name was, where that Seed would fall into. Do you believe that? Sure, He did! And from a literal womb would come forth this great miracle. God knew about it, He just revealed it to his prophet who was faithful and spoke the Word. Without even thinking about what It was, he just said It. He never tried to reason It out. « 142 † If you try to reason out... What if this man, this woman, or this man setting here, or somebody try to reason, "And I been crippled all these years. The doctor says, 'There's not a possible chance'"? Well, there might not be as far as he knowed, and that's true. 143 But if something can tear away them weeds, if God by His grace; not the preacher, not nobody else. But God can place into your heart a revelation, that, "I'm going to be well," there isn't nothing going to keep you setting there. There's nothing can hold you there, you're going to be well! But until that does happen, you're going to set right where the doctor says you're going to set; until that happens. It has to be revealed. It's the grace of God that reveals it. « 144 † Now, notice, God knew the woman It would come to. Notice Isaiah, there was no question. Isaiah didn't say, "Wait a minute, Lord! Wait--wait just a minute! What did You say to me? A virgin's going to conceive? Oh! What? Now wait, Father, there--there--there never was such a thing as that done." 145 He didn't hesitate, he just said, "A virgin shall conceive!" Right. « 146 † Notice Mary: "Now, now Lord, wait a minute. You know I--I never knowed a man. This is impossible! Nothing like this never happened! Ohhh, oh, no, nothing like this ever happened. How am I going to have this baby? I don't know any man, so it can't happen! Uh, Angel, you're just mistaken. I've got an optical illusion. You know, my church says, 'These days are gone.'" Nah! It would never have fell in such a place as that. Mary never questioned. 147 She said, "How can it be? I know no man." 148 He said, "The Holy Ghost shall overshadow thee. That's how it's going to happen." 149 She said, "Behold, the handsmaid of the Lord!" No question! « 150 † See, Isaiah, when God produced the Word by thought (revelation) into the heart of Isaiah, It fell into the right grounds, it was a prophet. That prophet didn't care for any man's wisdom. He didn't care for any man's intellectual. He didn't care about the person of anybody. He was a dedicated channel to God, and God spoke and he spoke. That's all. Whether it hurt, whether it didn't; whether it sounded crazy, whether it didn't sound crazy; didn't make any difference to him. It was God, not the man. « 151 † And when that Word went forth, now It becomes a Seed, It has to fall somewhere. If God said It, there's bound to be a womb somewhere for It to fall into. Just as He said, "All things are possible to them that believe. If you say to this mountain, 'Be moved,' and don't doubt in your heart, you can have what you said." See, there's got to be somewhere that's right! 152 Notice! Now, we find that Isaiah here spoke It. « 153 † The virgin Mary, as soon as... The grounds was already broke up. She had been a virgin. She hadn't "run around." The grounds had been already prepared, or predestinated by foreknowledge of God. 154 Even said, "She was a virgin." Right then God knowed what her name would be. For her name was on the Book of Life in Heaven. 155 Then, It was vindicated. Man then (to man) saw the expression of It by the works, when it was already done. Now we look back and say, "Sure, It was done," 'cause we see the works that was done. « 156 † Noah's works expressed to man, what his faith was in God's promise. Now, God met Noah, and He said, "Noah, it's going to rain. I'm going to destroy the whole earth with water." Now, it never had rained, that's the impossibility. Well, now, Noah got... Said, "Prepare an ark of the dimensions that I'll tell you about." And him being a carpenter, and he went to work and begin to take his foot adze, and everything to cut the boards, and fix it up there with the shittim wood, and put the pitch in it just like He said. And do you imagine what people thought about that man? 157 They said, "That man is actually crazy, because he says, 'It's going to bring water out of the heavens,' and there's no water up there." But, you see, Noah didn't think about that. His works was expressing to the people what his faith was and what God said would take place. 158 That's the reason the genuine Christian separates himself from everything but the Word of God, no matter what the people think, what anybody else says. He's separated because... He isn't just saying that; if he is, it won't be long till his works will be make known. He'll fall back and slip this a-way, and join this one, this one, start... he'll--he'll show what he is. But if he's a genuine, if the Word of God has bedded into him, then It's going to bring forth Its kind, you'll see that man preparing for that great hour. See, that's the way Noah did. « 159 † Moses, with a stick in his hand, came to take the people from Pharaoh. Now, could you imagine... Moses, the Bible said that he was taught in all the wisdom of the Egyptians. He was smart, he could teach their intellect things. He was taught all their wisdom. He didn't need to catch up on his education. Now, just think about a man out there in the wilderness, with all that education, and then God appearing to him and said, "Moses, take this stick in your hand and go down there in Egypt, and bring my children out with this switch you got in your hand. Just lick the whole thing with this switch." 160 Now, what if Moses would had said, "Sir, just a moment, I thought I was talking to an intelligent being, this great 'I AM' that you say you are. Now, how in the world will I ever take this little, old crooked stick I got here in my hand, and take over an army of million of man, armed with spears, fighters? And I'm not a fighter, I'm a shepherd. How can I ever do that?" 161 There was no question! Why? Why? The Ground in his heart! He was a predestinated person. "Gifts and callings are without repentence." God had told Abraham that He would do that, and there was the ground prepared. « 162 † And Moses took this stick and went down there and took that nation out of a nation. When he come with a stick in his hand, and told Pharaoh, "Let them go!" Pharaoh seen in Moses the works, that he had faith in what he was going to do, or trying to do. He had faith in the promise of the God that had made the promise, he went down to take it over. No other man would have done that, and no other man could have done it, he was ordained to do it. God, beforehand, had told Abraham that that's just what would happen. And when the time of the promise drew nigh, there was a little boy borned, a fair child. And the parents, Amram and Jochebed, was not afraid of the king's commandment. See, there was something, the grounds was already prepared. 163 O God, I hope I'm speaking to ground prepared, tonight! If the Seed can fall in the right place, and it's going to be some-... If it isn't, it won't happen. 164 That's the same thing. They say, "Brother Branham, that kinda takes it away from us." If it does, it takes it away from Christianity, too. See, you can impersonate anything. But if the... if it really falls in, the Word of God falls in the right kind of ground, it's going to bring forth its kind. It's got to, because It's a seed. « 165 † Noah... Moses, his works, expressed faith in the promise of the God that he believed. Pharaoh, the man, could see what was. Not... he couldn't see how Moses was going to do it, but he knowed Moses believed what he was talking about or he wouldn't be standing in the palace there with a stick in his hand. Said, "By this stick, I'll take them out from you." An old man, eighty years old; not an athlete, an old man, stooped shoulders, and whiskers hanging down to his... probably his waistline; and gray hair, if he had any. And there with that stick in his hand, saying, "'I'm going to take them out, let the people go,' THUS SAITH THE LORD. And if you don't do it, God's going to judge you." Amen! Why? That's... See, it... Was he afraid? Why, just one arrow, one spear, anything else would have ended it. He was fearless! He knowed exactly where he was standing; said, "God will smite thee, Pharaoh." Yes, sir. 166 For God told him, "You will come to this mountain again," and he knowed he was going there. 167 Hallelujah! We know where we're going too, at the end of this journey. God has promised! There's a Land beyond the river. Be fearless in your testimony. Amen. If it's revealed to you, you are fearless. You don't care if the whole world... what they say; you're fearless. When it's revealed to you, "This is the Truth coming from God," then you can't be fearless. If not, you can't be. « 168 † David, with a shepherd's sling, expressed to the whole Israelite army, the faith that he had in their God. Now, there was Goliath on the other side, and he stood out there and made his boasts. Many times bigger than David, he had fingers fourteen inches long. And he was a mammoth, big fellow, the Philistine giant. And here was David, the smallest one, he was even too little to be in the army; too much of a runt, they couldn't use him. So, his brothers was out there in the army. And, then, Goliath was making his boasts. 169 But David, now remember, it was revealed to David. He thought, "Here is the armies of the living God, standing in their own land, and there's a boasting uncircumcised Philistine out there." We'll call him "cancer" tonight, we'll call him "paralytic." 170 Why, David was no kind of a match for him, not with any kind of a weapon; he was no match. That man's shoulders was probably ten, twelve foot across; he was probably standing fourteen, fifteen foot high. A spear like a weavers needle, probably twenty foot long, the blade on it maybe four foot across. « 171 † And a little David standing there with a little piece of leather, goatskin or sheepskin, with two pieces of string tied to it. But it was revealed to him! Revelation struck him! Amen! He said, "The God that took me out of the paws of the bear, that took me out of the paws of the lion, how much more will He deliver that uncircumcised Philistine in my hand!" « 174 † Now notice the giant, on the other side, didn't believe it; neither will the cancer. He laughed, he said, "Am I a dog? You send a kid out here to fight me?" Said, "I'll pick you up, on the end of my spear, and let the birds eat your flesh." Why, he had all the... all, everything for his side. 175 But, you see, that didn't shake David at all. Why? It was revealed to him. He had faith in what he was doing. He knowed he was going to do it. And he did it, is because that it was revealed to him and he knowed where he's standing. 176 And if God would just spoke that, right down in your heart tonight, said "You're not going to be laying in that bed. You're not going to be setting in that chair. You're going to be well," there couldn't be anything change your mind in it. « 178 † Now, some of them said, "I know you're naughty." His brother said, "You come up here to see the battle. Now, you run back over where them sheep was." 179 He said, "Let me speak to Saul, the general." You see? 180 And Saul said, "Now, son, I admire your courage, but, you see, you're nothing but a youth. And he's a warrior from his youth, you're no match for him." 181 He said, "I was tending my father's sheep,..." He could base it on something! Amen. O brother! And the God that saved your soul, can't He heal your body? It's just the same, reveal to you, He's your Healer as He was your Saviour. See? But it's got to be revealed first, that's the difference. He had something to base his faith on. 182 Said, "Now, this never happened before." 183 But said, "The same God that delivered me from the paws of the lion, will deliver me from that uncircumcised Philistine." 184 He knowed what he was talking about. Because when the giant said, "I'm going to feed you to the birds"; he said "I'm going to cut your head off." There's the difference, see. And he did it! « 185 † Samson, caught out one day (off guard) in a prairie, and here come a thousand Philistines upon him. And he looked down on the ground, and there's where a mule had died, and he picked up the old jaw, jawbone, dry as it could be, and took out after those Philistines, beating them over the head with this old dry jawbone of a mule, and as far as I know, not a tooth ever fell out of it. And them Philistine helmets was probably a inch thick ('cause they beat one another with war clubs in those days), to keep a man from beating them on the head. But he took the jawbone of that mule and beat down a thousand Philistines, and the jawbone never broke. He just kept beating them, like that, as they come up. So, the rest of them took off for the rocks, see, they was getting away from him. Why? He believed it! 186 Sometime, to show you,... I want to tell you something else. Work on that pulsation, that spare of the moment, like Joshua did, like Mary Magdalene, all those. Just that moment when something is revealed to you, grab it. Hold to it, that spare of the moment. « 187 † Yes, it was revealed to him. He went to meet these thousand Philistines. Now what do you think when those Philistines said, "Now, look, coming there, that little shrimp; only about four feet and a half tall, to begin with; with seven little curls hanging down his back, like mama's little sissy, see; come along there with a jawbone of a mule. And look at us, what a great army we are! Isn't that ridiculous?" But what was he doing? He was expressing to those Philistines what had been revealed to him by God. He grabbed the jawbone and took off, because that's what He put in his hand; He put that in his hand, that's what he believed: he could do it! And by doing so, he was expressing to those Philistines what God had put in his heart to do. 189 They said, "You say, 'The Messiah's coming'? Why," said, "man, what's the matter with you? We been looking for Him for four thousand years." 190 He said, "He's standing right among you now." Hallelujah! So is He tonight! Uh-huh. 191 He expressed his faith by his revelation, because it was revealed to him that... he knowed he would baptize the Messiah. He was a man, thirty years old. He knowed He had to be there somewhere; he had never knew who He was, and there He was standing right among them. He said, "There's One standing among you now, Who you know not, and I'm not worthy to loose the latches on His shoes, but He'll baptize you with the Holy Ghost. And He's right among you now." He expressed it, his faith, because he knowed, in his day, he was to see and baptize God's Messiah. So, you see, the people could see the expression upon him, in the way he was preaching and the way he was acting, was expressing that he had a true revelation from God. « 192 † Now, to prove that it was true, walking right out of the crowd come the Messiah; just an ordinary young man walking down through there, dressed like other man. John said, "Behold, there's the Lamb of God that takes away the sin of the world." 193 "How do you know Him?" 194 He said, "He that said to me, in the wilderness, 'Upon Whom thou shall see the Spirit descending, that's the One that'll baptize with the Holy Ghost.'" 195 See, he knew Him because there was supposed to be a sign about that time. (Are you catching It?) John knew just about the hour, 'cause he was a prophet. It was revealed to him, that he know would be about that time, he'd see a sign. And when he seen that sign, he said, "He's standing among you." He knew It was there. 196 Oh, I see the sign that the end time is here. I see the things that's promised, for this end-time Message, coming to pass (unfolding) just exactly like the Scripture said. And I know that the time is at hand! I say that without hesitance. I believe it's right at hand, for I see the signs that He said would happen just before that time. It's ready to happen now. « 197 † John expressed his faith in what God had revealed to him. Therefore, works is faith's testimony. When they see you acting like you're healed, then they'll know you got faith that you are healed. 198 What does testimony say? Saying this: "I have it now, 'cause I received God's promise. It is now working in me. I am making ready for it to happen." Uh-huh. See, that's what you testi-... your works does. Well, sure! « 199 † Here, some time ago, next to my last trip in Africa; I was just over there this spring, but trip before that. There was a little baby that had club feet, and one foot... leg shorter than the other one. It never wore shoes in its life. Oh, it was a most horrible deformed. And I prayed for the baby that night, they had watched and seen those things done, they prayed for the baby. And the next morning I went down, walked by a shoe store. And I walked in there, and there was the man buying the baby a pair of shoes to wear. He believed it! Uh-huh. 200 Like this man over here, that believed that God would give him the baby. Sure, he believed it was going to happen, made ready for it. "I'm making ready." Although no physical results seen as yet, but that didn't make a bit of difference. He believed it, like Abraham, "called anything contrary as though it was not so." There! « 201 † Therefore, if your intellectuals does tell you... Oh, here's the stinger now. If your intellectuals does tell you that "This is the Truth, God is the Healer of sickness," your mind can witness that "That is the Truth," but if there is not the bedding ground in your heart (faith, to fall in) to express it, it will not happen. Though much... no matter how much this outside man can reason it with the Scriptures, and say, "it's right," that still doesn't make it Right. 202 How many takes the tapes? Did you get my sermon, not long ago, The Anointed Ones Of The Last Day? Did you believe that? See, it said, "There will be antichrists. Antichrists would almost deceive the very elected, if possible." Can it through... It can't, because it's impossible, they're elected. See? All right. 203 But He said, "The anointed ones." See, Christ means "anointed," but these were anti. They were anointed, but anti, against Christ in their teaching. Now, they could do anything that the rest of them could do. « 204 † Now, remember, you're in a cycle of three, but you're one person. Like Father, Son, and Holy Ghost, cycle of three, but one Person. Three attributes of the same God: fatherhood... Three offices like: fatherhood, sonship, and Holy Ghost. And you are: body, spirit, and soul. 205 Now, the outside body has five inlets to it, to contact your earthly home: see, taste, feel, smell, and hear. The inside, which is a spirit, it has five senses: conscience, and love, and so forth. But the inside of that, the soul, has one thing. That's where you live. « 206 † The Spirit can come out here and anoint you to do certain thing, and you do it, but that don't mean you're saved. Think of it. Caiaphas prophesied. Judas cast out devils. See, the Spirit anointed him. This rain falls on the just and the unjust, the weeds can rejoice with the wheat. But it's what it is at the core. There's where you can, intellectuals, can accept and say, "Oh, sure, that looks good. I believe that." That still don't do it. No, sir. And the spirit can actually make witness of it, and still it isn't so. Because if that soul hasn't come from God, it can make all the impersonations out here, but it cannot be real. You can act healing, you can act like you have. You can act like you receive it. Christians can act like they're Christians, and act and be ever so good at it, but that don't mean they're saved. That's exactly right, see. The Spirit can be there, the real, genuine Spirit. The Holy Spirit can anoint you, that still don't mean you're saved. It's that inside soul that never dies, it's got Eternal Life. It always was Eternal Life. See? It come from God, it goes to God, it's the soul. « 207 † Now, notice that, it's got to be. Five, f-a-i-t-h, outside; spirit, J-e-s-u-s; on the inside, y-o-u. See? That's how standing here, looking at you, I don't know a one of you. The spirit can anoint me, still I don't know none of you. But when that inside of the inside breaks in, that's God. 208 That's where the outside can reason. You take a man, say, "Well, you know, I--I know I'm not supposed to commit adultery. But, you know, then the spirit tells me I shouldn't commit adultery. But, you see, way down in there is still that thing in there." See, it'll kind of govern around, and better watch it. 209 But when it's directed from the inside, it throws all the rest of it together. That's the guidepost. That's the control tower, the inside of the inside. The soul controls the spirit, the spirit controls the body. 210 So an outside whitewash don't make any difference. Them religious people back there, that Paul called "whited-walls," and so forth, they were (outward) just every way the... a believer, and they had prophesies among them, and everything else but the inside of the inside ("the soul that disbelieveth"). 211 That's the reason I say people can jump up and down, and speak in tongues, people can shout, lay hands on the sick, and heal the sick and so forth, by faith; all these great things there by the Spirit, still be lost. Anointed ones. « 212 † Notice Jesus has said, "Only believe, for all things are possible to them that believe." Faith and works are husband and wife, they work together. The husband works with the wife, the wife with the husband; they identify one another. 213 Like a man says he's "married" and yet he can't produce and show that he has a wife, you doubt his claim. See? A man said, "I'm married." "Oh, oh, I--I don't know about that." See? See? Be kind of hard thing for me to believe him. 214 So, you see, if you have what you say you have, "I have faith." How you going to show me you got faith? By your works. See? « 215 † "My works shows my faith." See? See? Now, what--what you're speaking of: your faith is what God sees in you, your works is what the other people see in you. 216 That's for difference between James and Paul here, explaining about Abraham. They never contradicted one another, they was both the same; married. 217 So is faith that doesn't produce works, anyone has a right to doubt your testimony. Now do you hear it, before we start the prayer line? If your faith doesn't produce works with it, you can't make anyone believe that you're healed. Say, "Well, I don't know." See? "Why, yeah, sure, I got all the faith in the world." You don't. Because, if you are... got faith, then works is married to faith. They're husband and wife, one--one identifies the other one. « 218 † Let's think of Abraham for just a few minutes. Abraham got that holy union in complete, see, he got the whole thing together. He called things, contrary to his faith, as though it was not; and acted on the same principle. I can imagine, after about twenty years, somebody come by and said, "Father of nations? Huh! Abram, you said your name was 'Abraham,' which means father of nations. Just how many children do you have right now, Abraham?" See? 219 That didn't stumble him a bit. The Bible said, "He staggered not at the Word of God, through unbelief." He went right ahead making ready, keeping all the booties ready and the bird-eye and everything, he was "going to have the baby." That's all. « 220 † Even Sarah said, "You know what's going to happen? You're going to have the baby, but I tell you the way we're going to do it. Hagar now is my maid, I'm going to give her to you." Cause, polygamy was legal then. "And she'll have a baby, and I'll take the baby myself." But Abraham didn't believe that. Nope, he wouldn't do it. But Sarah was inspired to do it. 221 So, God told Abraham, "Go ahead and listen to her," but He said, "yet this is not what I promised you. This is not the way I promised it." « 222 † Now watch, he called anything "contrary," and his body then dead, and Sarah's womb the same. Now, he was an old man, a hundred years old. Sarah was ninety years old. Now notice! The deadness of Sarah's womb or the deadness of his body wasn't even brought under consideration. 224 Listen to this, now. "Against hope," all hopes was gone! Oh, every time I go to feeling a little "blue," here's the chapter I turn to, Romans 4, see. 225 Now listen, 19th verse. « 226 † At a hundred years old? Look, his body now dead (his manhood), and Sarah's womb dead. He's... It wasn't even considered. When it's revealed to him, that bed is not considered. You're a paralytic, or whatever you are, that isn't considered. The wheelchair's not under consideration. Or the little boy, maybe paralyzed, whatever it is (I don't know), it's not under consideration. Don't even consider it. 227 "But the doctor said, 'He'll never get out of here.' The doctor said, 'She'll never come... '" That's not even considered. 228 "Well, look, I'm an old person, I'm getting middle aged." I don't even consider it. « 229 † And we are the children of Abraham (Hallelujah! ), not as Isaac was, but his Royal Seed (through Jesus Christ) by the faith that he had, Abraham's Seed coming forth in the last days to shine like the stars. Abraham's children! "Considered not his own body now dead." Neither even considered it! It wasn't even brought into question whether God would do it or not, God said he would do it! Why? It was revealed to him. Is that right? 230 When it's revealed to you, when it really... something... You can't make it happen, it's got to be revealed to you. Then you don't even consider anything else: how impossible it is, don't consider what the doctor said, you don't consider what mama said, what papa said, what the preacher said, what anybody else said. You just consider what God said! « 231 † "He considered not his own body now dead, neither the deadness of Sarah's womb. It wasn't even brought under consideration. Oh, my, that just shakes me. Body dead, nor the deadness of Sarah's womb, not even brought under consideration. « 233 † Notice, the holy faith of God was united with the holy works of his prophet. Remember, God's holy faith was revealed to Abraham. He received it, and by there he started with his holy works, by believing. The seed of promise had a place to grow. What if he said (Abraham) "Well, you know, Sarah, after all, it's been twenty-five years since God made that promise"? Huh-uh! "If something would a-happened," see. But it wouldn't. God knowed it wouldn't. 234 What if the virgin Mary said, "Well, now, wait a minute! A--a virgin conceive? Well, they'll throw me out of my church if I go in and say such a thing as that"? Now, she would have thought those thoughts if it hadn't been that prepared bedding ground. 235 When that prophet said, "A virgin shall conceive," that settled it. See? 236 "These signs shall follow them that believe." If a bedding ground is laying there when that Word drops there, it takes a-hold. There's nothing can stop it. « 237 † Now, quickly, while we finish. See, the Seed had a place to hide. God knew it, or He would have never give the promise to Abraham. Now listen, real close now. God knowed where that promise was going to; He never even called Abraham till he was seventy-five years old, but he was His predestinated servant from the beginning, so was Sarah. 238 Notice, remember, he had no Bible to read from. He didn't have it as easy as we got it today, to read His Word and see others who've took It. Remember, he only had It by revelation, and that's the real thing. Same as it was by Joseph, in Genesis, there was no Bible. Remember, Moses wrote Genesis, Exodus, Leviticus, and Deuteronomy. None of those characters in there had any Bible to read till after Moses. Is that right? They didn't have a Bible that we got, to help us along in our cripple condition. They were rugged men who... was revealed to them by God, and they stood right there. Nothing moved them. Now, do you think that we can still have that rugged faith? If It's revealed to you! « 239 † Pardon the expression, or the testimony at this time, just before closing. I remember that up here in "Twin City," I think Brother Brown and them was with me; and I was taking the life of Joseph, in the Bible. And I read that Bible, there was a man there was nothing against! Abraham, Isaac, Jacob, and all of them, had something against them, but not Joseph. What a man, a perfect man, a perfect type of Christ! 240 When I read that, I just got to crying, one day, in my little ol' hotel room. And I went over in the closet where I had my clothes hanging, pulled the door together, and I said, "God, I want to thank You for a man like Joseph, a man who once lived on the earth, a--a man in flesh like I am, a man that could believe You and take Your Word." He was hated of his brothers. He couldn't help being spiritual. He saw a vision. He could interpret dream. All of them hated him for it. He couldn't help that, that's just what he was. « 241 † See, it just wasn't to the others. They ought to have loved him, but instead of that... When he told them, sometimes things against them, "Oh," they say, "here comes that dreamer." See? And they hated him without a cause. 242 I said, "Why did they do that?" And yet that man never moved, he stayed right there. See? I said, "Thank You, Lord. O God, thank You for such a man." 243 And right then the Holy Spirit revealed to me, said, "You'll have a son, and you'll call his name 'Joseph.'" I got up from there and thanked the Lord. « 244 † Becky, setting back there, had just been borned about a... she was about a year old. She was with cesarean, it runs in my wife's family to be cesarean; 'cause they don't unhinge like the woman should, the bones are solid like a man, and she had to be cut from her mother. And the doctor told me, he said, "Brother Branham, don't you never have another child by this woman." Said, "Her womb is as thin as a balloon." He said, "You'd better let me tie those tubes." 245 I said, "No, I wouldn't... don't think about doing that, 'Doc.'" 246 He said, "Well, you--you--you'll... She shouldn't have another child." Said, "You're going to ruin her," said, "she'll die." Said, "We had an awful time there," said, "you just... she just did come through." 247 And then the Lord told me I was "going to have a son" and his name would be called "Joseph." I never was scared about it. All of you... many of you remember it. « 248 † I went forth announcing, "I'm going to have a baby and his name's going to be Joseph." How many remembers it? Sure! All around, out over the country, everywhere, telling people, "Going to have a baby, his name's going to be Joseph." 249 Just the same as that little boy was raised up, in Finland, from the dead. Brother Jack was right there when it happened. Told you, two or three years before it happened, "There'd be a little boy," how he'd be dressed, where he'd be laying. "God said so!" 250 "How is it going to be?" 251 "I don't know! But it was revealed to me that it was going to happen!" « 252 † It was revealed to me, "I was going to Arizona, and there I'd meet seven Angels. And they would tell me then what... a Message that I was to preach." And that was the Seven Seals. It happened! How many remembers me saying that? The tapes and things will go to that. And it happened! Magazines, everything else, took the picture of It. That Light there in the air, they can't even understand It yet. There it was. 253 I remember calling Brother Jack and asking him about that, Christ being standing there, and Brother Jack said, "That's in His glorified state." See? I love Brother Jack. He's one of the best theologians I know of, but I just couldn't hit it just right. 254 I was standing there, I said, "Lord, how is this? Young Man here" I said, "with hair like wool." 255 And He said, "He is wigged." Watch in the book, before it ever happened, I said that. And that day when that happened, it went up. And then you turn that picture sideways, if you've got Look Magazine or Life Magazine. Turn it sideways. There He is, just perfectly, Hoffmann's Head of Christ, looking right down where I was standing; there It is in the magazine! How many's ever seen It? Course, you've all seen. There, looking right back, proved exactly the revelation was correct. « 256 † Why wigged? Why, the old English judges, the Jewish judges, used to wear a--a--a wig, they do yet in England; when he's... that's supreme authority, he wears a wig. And that showed Him standing there, wigged by Angels' wings, He is the Alpha and Omega. He is the Supreme Judge, and none other but Him. He is to look upon as Alpha and Omega. And there He was a young Man, no, or more, thirty years old, wearing a wig of white. Showing that He was Supreme, God, "The Father hath committed all judgment unto the hands of the Son." Hallelujah! The revelation is never wrong! Speak It anyhow, no matter what it sounds like, goes right with the Word. « 257 † We knew we was going to have a baby. Everybody said, "Is this Joseph coming?" 258 I said, "I guess it is, I don't know, but I'm going to have Joseph." 260 I said, "Sir, I said, 'God told me I was "going to have a son" and I would "call his name 'Joseph'"!'" 261 There was three people that left a certain denominational church and come to our church, and heard me saying that. When Sarah was borned, they said, "Why, he's a false prophet." 262 I said, "Wait a minute, ladies, I never said when, neither did God say when. He told me, was 'going to have a... ' He was going to... told Abraham, they was 'going to have a Isaac,' but Ishmael was borned in between that time, but it didn't take It away." I said, "God said I'll have this boy and we'll call his name 'Joseph.'" « 263 † The doctor said, when he come up, he said, "Reverend, I'm going to tie those tubes now." Said, "I..."
265 He said, "Well, you might get married again and have that boy yet." 266 I said, "I'm going to have it by her! God said so!" I couldn't read it out of the Bible but it was wrote on my heart by revelation, by faith; God said so! Didn't want to stagger at the promise of God through unbelief. Some of them said, "You meant 'Josephine.'" I said, "I meant 'Joseph.'" 267 Four years passed, finally she was going to be mother again. « 268 † Then a woman, (a false prophecy sent forth across the country) writing words, said, "Now Meda's going to die, during this time, because I was sent to lead Bill." And it said that "He won't listen to me 'cause I'm a woman, and God's going to get even with him now by killing his wife." 269 I said, "God sent Jesus Christ to lead me." See? And I said, "I'm led by the Spirit." 270 Poor little Meda. We had a nurse that had been healed there in a meetings, you all know, Mrs. Morgan, (and one of Mayo's nurses, the worse cases). Well, she's on the record, "dead," about twenty years ago, of cancer, "sarcomas cancer," in Louisville, right on the Baptist hospital record. She's nursing in--in Jeffersonville, in the hospital, now. She's been there for all these years, 'cause God said "She'd live." 271 And, so, Meda loved her, and she said, "I want Margie come with me, Bill, I don't feel like going to the hospital." 273 And she said, "Bill, do you think I'm going to die?" 274 And I said, "I don't know, but the baby is going to be born, anyhow. You're going to have a Joseph." 275 She said, "Is this him?" 276 I said, "I don't know, Honey. I can't say, but God said we're 'going to have Joseph,' and we're going to have Joseph. I don't care what anything says, we're going to have Joseph. For the same God that's told me all these revelations, told me that, He never failed on others and He won't fail on that." « 278 † The Bible was... and laying in my car. And when I did, the wind had blowed it over to where Nathan was setting, and David; said, "Go tell My servant David; I took him from that sheepcote, from feeding those few sheep of his father's, and I made him a great name like the great man." (not all the--the greatest name, but just like great man; never made him a Billy Graham, but a... give him a name, you know) Said, "Well, I done that, but" said, "I can't let him build the temple, but his son..." And just as soon as It said, "His sons," oh, my, there it was. 279 I said, "Joseph?" That's right. 280 Right there, in the house I went. And there's the little fellow, so big she... she's a big ol' boy, she couldn't hardly walk, going out through the field. I run, throw my arms around her, and I said, "Honey! Joseph is coming. Joseph is on his road." « 281 † Anyone knows, with cesarean, you can't let the baby drop. That night the baby dropped, the water broke, everything else. 282 Next morning, at seven o'clock, we went over to the hospital, the doctor said, "Oh, mercy, goodness." 283 I kissed her good-bye, said, "Honey, it won't be long, Joseph will be here." Right up the steps, she went like that on the operating table. 284 A few minutes, the nurse come back, said, "Rev. Branham?" 285 I said, "Yes, ma'am." 286 She said, "You got a fine, seven pound, three ounce, boy." « 288 † Just exactly as it said, "Rahab the harlot," James said, "was justified by works." But why? Her faith! 289 She said, "I hear that God is with you." She didn't want to see how Joshua wore his hair, or how he wore his clothes. She said, "I understand that God's with you." That's all was necessary, she made ready. 290 Just as true vision today, (I'm closing just in a moment) true visions from God today, it's a promised Word for the day. Say, "These visions, Brother Branham, where do you get that?" People stumble at that. Did not Acts 2:17, said, "It shall come to pass in the last days that your young man shall see visions, your old man shall dream dreams"? Isn't that right? That's what the Bible said. « 291 † All right, now if that's so, also look at Malachi, the 4th chapter, and find out if this isn't promised today. How can you have faith in It? The Bible said so! 292 Now you take Luke 17:30 and read it. Jesus said, "As it was in the days of Sodom, so shall it be in the coming of the Son of man. Just like it was at Sodom. Now, look at the position of the world today: Sodomites. Look at that Billy Graham and Oral Roberts, them two witnesses, down there witnessing to the denominational churches. One to the Methodist, Baptist, and Presbyterian; the other to the Pentecostals. This one, that one, and the other one. « 293 † But remember, Abraham wasn't in Sodom, he was already called out. And there was One stayed and talked to him! And the One stayed and talked to him, showed him a sign. With His back turned, He said Sarah was going to have the baby that he had waited on. Amen. With His back turned. And he called It, "God, Elohim." 294 Now, that brings to pass today, because we have faith. And I know this is of God, is because this and other Scriptures point to this hour. Revelation 10, said that "in the hour of the seventh angel's Message, when he begins to sound forth his Message," not in a healing service, but the Message that follows the healing service. « 295 † Jesus went forth and preached; he said, "He healed the sick, and everything. O that young Rabbi, the Prophet, He's a great Fellow. We want Him in our church." 296 But one day He stood up, said, "I and My Father are One." Oh, my. They didn't want Him no more then. Yeah. Oh! 297 "Except you eat the flesh of the Son of man, and drink His Blood!" He didn't explain It. Said, "Except you eat the flesh of the Son of man, and drink His Blood, you have no Life in you." 298 Why, I imagine, them doctors and nurses said, "This fellow's a vampire, trying to get us to drink his blood." See, they didn't understand It. He knowed it. 299 But them disciples, they might not have been able to explained it, but they set there and believed It anyhow, amen, for It was revealed to them. Yes, sir. They knowed It, the Scriptures had declared It. « 300 † It could be asked then to me, this that you might say, "Why do you have faith to believe in these visions, when--when there's so many false impersonations goes forth?" 301 I'm going to speak a little something, strong, just for a minute now. When so many false impersonations are around, remember, my brother, they are also spoken of that they should be here at this same time. That's exactly, just as it was in the times of Moses. Moses went down to perform the works of God before the people, and there was Jambres and Jannes standing there. But who was first to do it? Then these other ones was impersonators, 'cause there had to be a original first for them to impersonate. If that had been the original... Uh-huh. Nah, we're not--we're not lost, we know where we're at. See? See, by the Scripture and by the revelation of God, that's why you still stand. And remember, He said, "As Jambres and Jannes withstood Moses, in the last days these impersonators would rise on the earth again." Did He say it? [Congregation says, "Amen."--Ed.] So, we got them. « 303 † But that didn't stagger Moses. When Moses turned around and done a miracle in the Name of the Lord, and here stood these impersonators, done the same thing. That didn't stop him, say, "Well, I guess I had better quit and go off the field." He stayed right there. For what? It was revealed to him. Hallelujah! He knowed by the Word of God. He knowed that the Word would finally catch up with them. He knowed there'd come a time when the Word would manifest Itself, and they couldn't go no further. 304 So have I knowed this, all these years. See? That's right, that the time would come. When any miracle that God sends, a real miracle, there's always a change in the whole system. If God sends something into the church, and the old system's not changed, He sent it in vain. When a message goes forth in signs and wonders, there is a Message follows that. When Jesus went forth healing the sick, then come His Message, "I and My Father are One. I am He." See? See, they--they didn't believe That. They believed His miracles. Said, "If you can't believe Me, believe those miracles." Said, "They testify to you, Who I am." Oh, my. Glory! Who was first? Moses! Then they impersonated him. But the great truths still remains the same between the right and wrong, they cannot accept the Message! They cannot accept the Message that's unadulterated, from the Word of God. « 305 † I don't care, Judas could have done all kind of signs and wonders; but, when he come to receive the Holy Ghost at the Day of Pentecost, he showed his colors. That Devil can come right up and impersonate right to the very thing, till it comes to this Word, but he can't take all that Word. He can bring it all up, maybe to one Word like Eve did, the Devil did to Eve, but he can't cross it all. Because the only... the whole thing is the Body of Christ. See, Word now. Neither could... They could not, cannot take the Message now, neither could Jambres and Jannes take Moses' Message. They could not do it. Their works of impersonation was made known, because they could not be able to follow God's Word vindicated by His anointed prophet. See? « 306 † They could not follow Israel out. Why? They were denominational, Egyptian babies! They could not follow that Word. If they did, they had to leave Egypt. The Nile was good to them, and they couldn't do it. Although they could impersonate the works, and do what Moses did, but their folly was made manifest when it come time to leave. Then God really poured out it, on them. 307 Same now! They might do all kind of false impersonations and things, that don't do nothing but magnify the right thing. And any believing child knows that's the Truth (uh-huh). Here you see in plain view, then, the works of their folly of their impersonation. If you'll... if your work is the true Word and vindicated by It, by your faith, it will manifest (and the--and the promise of God) in Its original written Word. « 310 † Well, now, brother, if the works of Luke, the 17th chapter and the 30th verse, the promise of Jesus Christ, just before His coming, that the world would turn back to Sodom and the messengers would go out, and the things would be done just exactly; if that isn't taking place, then don't believe me that I've told you the Truth. But if it is taking place, then believe that It's Him, "In that day the Son of man will be revealed." Amen! The Son of man will be revealed in a body of flesh, you people the Church, just exactly like it was before the days of Sodom, a called-out group away from all of them, setting out, believing the promise of God. Glory! « 311 † Then, the works that the Holy Spirit is doing today, by these visions never failing, promises never failing, all the apostolic signs promised in the Bible, of Malachi 4, and, oh, the Revelation 10:7, all of that is being fulfilled; and proved by scientific, every other way. And if I haven't told you the Truth, these things would not happen. But if I have told you the Truth, they bear record that I've told you the Truth. He's still the same, yesterday, today, and forever, and the manifestation of His Spirit is catching away a Bride. Let that faith (revelation) fall into your heart, that "This is the hour." « 312 † Dear God, Who was manifested in the flesh in the person of Jesus Christ, that raised up from the dead, the third day, according to the Scriptures, and ascended on High, and sent the disciples out to disciple all the world, and said, "These signs shall follow them that believe." 313 God, to the Pentecostal church of this day, the restoration of the gifts; may, Lord, those man, maybe some of them present here, some of them hearing the tape around the world, may they realize that this is the calling out of the Bride, not a Pentecostal message. The Pentecostal message was to restore the gifts back in the Church. But this is the calling forth of the Bride, another Message that was to come just before Sodom was to be burned. Let them understand, dear God. Faith, I believe This, because It's revealed by Your Spirit through the Word of God and has been vindicated and made manifest to the whole world. Certainly, Lord, in the minority, always Your groups are that way. But You said, "Fear not, little flock, it's your Father's good will to give you the Kingdom." « 314 † So, I pray, God, that man will look away from their intellect, look away from what they might think is right, and look into the Scripture. And was spoken last night, let the people here think like the queen did in the days of the great destruction of Babylon, she said, "There is a man among you named 'Daniel,' was in your father's kingdom. The pentecostal father was in his kingdom, and He is a dissolver of all doubts." 315 And now, Lord, let the Holy Spirit that was in the Pentecostal kingdom, the kingdom that was Martin Luther's, was John Wesley's, and--and on through to John Smith and Alexander Campbell, and down through the age. He's a Dissolver, He dissolved the thoughts. And the--the people in the days of Luther, that man, "The just should live by faith." The Methodist, He dissolved all the doubts, that "They should--they should be sanctified," And in the days of the Pentecost, they spoke in tongues, give the manifestations of the Spirit by Divine healing and so forth, It dissolved all the doubts in the pentecostal's heart. But, O God, they denominated. They went right back out to take man's ideas. Therefore, now when the Bride is being called as You've promised it here in the Scripture, reading It before the world, night after night, and we watch It with our eyes. God, may It dissolve all the doubts in the people's heart. May they flee quickly to the open Son, to be ripened, to be taken into the garner and not be left in the stalk to be burned, but may they go to the garner tonight. In Jesus Christ's Name. Amen. Thank you for your attention. Let God deal with your heart. 317 Well, did you start with a hundred, or one, and one to a hundred, or what? [Brother Billy Paul says, "One to a hundred."--Ed.] One to a hundred. All right. « 318 † Let's have prayer card number one. If you got it, hold up your hand so I can see. If you can't... If you can stand up... if you can't, we'll pack you. Prayer card number one, right quick. Who has that? What'd you say? A, number one. (excuse me) A, number... This lady here, do you have that card? Come right here, will you lady? A, number two. Have you got it, someone? Raise your hand quickly. Right here, lady, come. Number three. Got a card? You got a card? You all... Don't have any cards? In this... in... All right, you don't have to have it. Three, four, five. A, one, two, three, four, five. Let's see, there's one, two, three, four, five. A... All right, here they... Five, six, seven, eight, nine, ten. All right, just line up, just start lining up. « 319 † Now, if you can't come, wave your hand like that so they can pack you. I've asked these people here, that don't have cards... Don't have to have, I'm just asking you. Now look, you--you crippled people here, I suppose you had to come early 'cause you just... I told him "early." Now, you don't have to have a card, if you've got that faith like I taught. See, if it's revealed to you, all right. If it isn't revealed, no matter if you be in a dozen prayer lines, it wouldn't help a bit. You know that? Do you believe that? See? I might pray, I do all I could, get down on my knees, and lay hands on you, anoint you with oil, anyway you wanted to, and pray... Until God, by grace, reveals that in your heart, that "It's over," then it's done. You don't even have to be in the line or nowhere, it's done anyhow. « 320 † All right, four... One, two, three, four, five, six, seven, eight, nine, ten, eleven, twelve, thirteen, fourteen, fifteen. All right, sixteen, seventeen, eighteen, nineteen, twenty. Is anybody I've called that's got a card and can't raise up? Raise your hand, got a card and cannot raise up. All right. I can see poor, little, old Anna Jeanne setting, playing that all night, nearly, sometime. I want everybody real quiet and reverent in here. Now, prayer cards one to fifteen, I believe it was. « 321 † One, two, three, four, five, six, seven, eight, nine, ten... Now, you're getting too many. That's more than we called. That's all right. Stand still, just where you are. Don't no one... Just... you'll get... you get prayed for, but just... See, just wait till they call your number and then, you know, we--we don't have too many standing here. If the Lord should do something, you'd blind it off from the people and they can't see it, you see. God bless you. Now let's pray for these handkerchiefs while they're getting ready. « 322 † Dear God, here's handkerchiefs laying here that comes from the sick and afflicted. This faith that we just been talking about, Lord; I remember You saying, in the Bible, in the Book of Jude, "Earnestly contend for the faith that was once delivered to the saints." And from the body of the saints they took handkerchiefs, not because they were special people, but because they were believing people. They were man of like passion as we are. They said, "Elijah" was like that and he "prayed earnestly that it wouldn't rain." And, God, he prayed that so the people would repent. You revealed it to him to pray for them, to pray in that manner to fulfill Your Word. No doubt You showed the prophet a vision. And, Lord, tonight I'm praying for these people to be healed. I'm not Elijah, he was taken into Heaven, but his Life and Spirit still lives on. So we pray, dear God, that You will honor the prayers of Your people. And honor all of us now as we'll pray for these handkerchiefs, that when they're laid on the sick they will recover. « 323 † We realize, Father, that we're a--a dying generation of people. We're heading... faced--faced with Eternity. The world has gone insane. Murders; little girls being cut to pieces and ravished. The people, men wearing their hair like women, women like men, they're just perverting. The race is dying. The world's a-dying. Everything's a-dying. The church is dying. 324 O God, bring Life. Bring Life, O God, Life of faith. Reveal to these people, Lord. I can only pray and lay my hands upon them. But You're the One that can heal them, and You alone can heal them. I pray that You will, Father, to each and every one. Grant it, with my hands upon them, and asking with all my heart; in the Name of Jesus Christ, heal these people. Amen. « 326 † Procedure is just exactly like my honorable Brother Gerholtzer here, started his ministry many years ago. [Blank.spot.on.tape--Ed.]... with faith in God, believing God, believing that God healed the sick by faith. And it never has changed, but God has added in this last day, gifts, gifts that He promised. God did it be-... not because He had to, but because He promised to. And if He promised, then He has to do it; because He has to keep His Word. « 328 † You say, "Brother Branham, what'd you say there?" 329 "Yes, sir!" God sent a prophet up to Hezekiah and told him, "'You're not coming off that bed,' THUS SAITH THE LORD. 'You're going to die there on that bed.'" That right? 330 But that prophet turned... or that king turned his face to the wall, and cried out in bitter tears, and said, "Lord, I need fifteen more years. I beseech Thee, Lord, to hear me." Now, the king was the greatest man in the world, in politics; but, the prophet was, in God's sight. That was God's king; but it was God's prophet. So, God revealed to the prophet to take some... boil some... [Blank.spot.on.tape--Ed.] You know? Understand? « 331 † Now, that you might understand now, because I've preached the Scriptures here, "As it was in the days of Sodom, so shall it be in the coming of the Son of man." In the days that the church is being revealed? No! "In the days that the Son of man is being revealed." What is revealed? Made known! That right? Reveal! The day that the Son of man is being revealed, it'll be a day like Sodom and Gomorrah. Is that right? 332 Now, look what happened. They had two main messengers, down there in Sodom and Gomorrah, because there was a bunch of lukewarm Christians down there. Is that right? And they had two main messengers (now listen close) down in Sodom and Gomorrah, preaching. But one of them who stood out here with Abraham's group. That right? « 333 † Now look! We have never, in all the history of the church, ever had a universal messenger to the church that his name ended in h-a-m, till now: G-r-a-h-a-m, which is six letters, G-r-a-h-a-m. But Abraham's name was spelled: A-b-r-a-h-a-m, seven letters. See? So the universal church, being the letter of man (six, man-make organization), yet has received their messenger. They've had a Sankey, Moody, Finney, Knox, Calvin, so forth, but never a "h-a-m." Is that right? But they got it, and he's a messenger, sent from God, and he's battering them walls as hard as he can, "Get out of here! Repent or perish!" 334 But remember, the Elected, predestinated, foreordained covenant, Abraham and his group got a Messenger, too. Uh-huh. Watch what He did. He gave them a sign that the time was near for the fire to fall. Now, it's fire now we're looking for, atomic fire, the wrath of God. « 335 † Now, that Messenger did something. He spoke about a women that He had His back turned to, and told her--and told her she was doubting what He was saying, told her her conditions and what was going to happen. Is that right? Did He say that the Son of man would reveal Himself in the same way in that day? Well, do you believe that's the Truth? 336 And in the invisible union of the Church, the Bride to Christ, that Messenger is here now, which is Jesus Christ, the same yesterday, today, and forever. 337 Now, He only speaks through His prophets. The Bible said so! "He never does anything but first He makes it known to His prophets," Amos 3:7. He always has done it. He never changes His pattern. See? And the prophet can only speak, if He's true, what God tells him. Is that right? That's true. « 338 † Now, do you believe He could tell me what's the matter with this woman before I even look at her? Do you believe it? Why, she's suffering with cancer. That's right. It's on her breast. She's got a boy, on her mind, he's suffering with a kind of a mental condition, nervous condition, and complications. That's right. Do you believe that? And that's true, isn't it? Do you believe now that your faith was saying that, has anchored, that you got it, you're going to have it? Then go, and the Lord Jesus will make you well. See? See? Do you believe? With all your heart? 339 Now, do you believe, without looking at this woman, the Lord Jesus can tell me what's her trouble? How many believes that? Now, you know... and I've never even... I... only thing, I just seen a skirt. I don't know, couldn't tell whether it was man or woman; but just standing there. I want her to believe. Do you believe, lady? Here, the patient, do you believe? Raise up your hand if you believe. If you believe with all your heart, you can have that baby that you're asking God for. See? See? You believe? You have faith in God? Now, that don't heal, that just identified. That's the works that identifies the faith of the Presence of God, His Word made manifest. « 340 † This woman is wanting a great thing, too. That's not a baby, but she's wanting the Baptism of the Holy Ghost. I'll tell you what do. If you'll get rid of them cigarettes, God will give you the Baptism of the Holy Ghost. Go, believe It, see. Do you believe? Have you faith in God? 341 This man standing here, is a man I've never seen in my life. I don't know him, but he's suffering with something wrong in his chest. He had a fall that did that, not long ago. He isn't from here, he comes from Arkansas. He's a preacher. Go on home and preach the Gospel. See? See? See? I've never seen the man in his face. « 342 † There's a woman standing here, I don't know the woman, never seen her in my life. God knows her. 343 If He can reveal what her trouble is, or something about it, would you believe? All of you? This is only a work identifying the faith that I have to preach what I've told you about, tonight. That's what God revealed, and this is the works proving It. Now, you have to have faith to get well. 344 This woman here, I don't--I don't think I know her. Yes, I don't know her but I know somebody she knows, 'cause I see him standing here before me. She's suffering with a headache. Isn't that right, lady? Do you believe that God will heal you? Pearry Green's sister. That's right, and I never seen her in my life. That's right. I seen Pearry Green standing here, looking at me, going like that. That's right. I don't know where Pearry Green's at. Do you believe? How much do you believe? If you can believe, all things are possible. If you can't believe, nothing can happen. « 345 † The little lady with gray hair, setting there looking at me, right here, do you believe God? Do you believe that God can reveal to me what you're thinking about there? Got a tumor on the breast. You believe God can take it off for you? Yes. Have faith and believe. Now, what did she touch? 346 The woman that touched the border of His garment, the Bible said... You that want to get the Bible, He said, "He's a High Priest that can be touched by the feeling of our infirmities." Isn't that right? He's that High Priest and He's standing right here, them people are touching Him. 347 There's a little, thin woman, raised up her hand, setting right here. I never seen her in my life, but she just then touched Something. Here's what it was. She's praying to God. She has trouble in her chest, she also has a stomach trouble. God heals you, if you'll believe It. You must believe. "All things are possible to them that believe." « 348 † There's a man setting way back in the back, looking this way (about the second row, coming this way), suffering with asthma. Do you believe God will heal you, sir? If you believe It, God will make you well. You can have what you ask for, if you believe It. 349 There's a woman setting right here, looking at me, across here, gray-headed. If you believe with all your heart... Do you believe It? All right, that gallbladder trouble will leave you then, if you believe It. « 350 † What do you think about It, laying here on the cot? Do you believe that God can heal you? If God will tell me your trouble, will you believe Him? If you'll believe, that cancer will leave you and you'll get well. Why don't you rise up, and take your bed, and go home? Do you believe? Will all of you believe? Well, now, what about right now? Has God dropped that faith in your heart? Everybody in here, raise your hand. If God's dropped that faith in your heart, let's lay your hands on one another, right down along the line here. Put your hands on... Right now, quickly, while the Holy Spirit is a-moving, put your hands on one another. The man's up, running down the line, praying for others. « 351 † Let's stand to our feet and give God praise, everybody. There's no need of going any farther. Identify Jesus Christ, the same yesterday, today, and forever; you, what your afflictions are, whatever it is. If you believe Him, stand upon your feet, right now, and believe. 352 Almighty God, the God of Abraham, the God of Isaac, the God of Jacob, send forth Your power and heal this group of people just now, in Jesus Christ's Name. Amen.